News: Swiss design brand Vitra has acquired Artek, the Finnish furniture company co-founded by Modernist architect Alvar Aalto in 1935. Vitra succeeds Swedish family-owned investment company Proventus, who took over majority ownership of the brand from the founders' families in 1992. Artek CEO Mirkku Kullberg said the buy-out is intended to give the brand a more international presence. "The international dimension, which was a clear goal already in Artek’s founding manifesto of 1935, needed to be revitalised," he said. "That arena is where we want to be, and alliances or ownership arrangements are one way of building the future. In our judgment, having an owner from the industry was the best choice for Artek." "Vitra has held Aalto and Artek in high regard for decades," said Vitra chairman Rolf Fehlbaum. "Like Vitra it is a commercial-cultural project which plays an avant-garde role in its sector. For Vitra it is important that Artek can continue and further develop this role." Further details of the deal have not been disclosed. A spokesperson from Vitra told Dezeen that Artek will continue to operate as a separate company, with no changes in management or manufacturing for the moment. "Artek and Vitra are both very creative companies so any crossover is likely to be in creative collaborations," she added. Artek is already the distributor for Vitra's furniture in Finland. Artek was founded in 1935 by Aalto and his wife Aino, art promoter Maire Gullichsen and art historian Nils-Gustav Hahl. The company's core archive comprises Aalto's birch wood furniture designs including Armchair 41 created for the Paimio Sanatorium he completed in 1932 (pictured) and Stool 60, the much-copied classic that's been in continuous production since 1933. The brand is extending its range and has recently acquired the rights to Finnish designer Ilmari Tapiovaara’s furniture. In recent years the brand has also been collaborating with high-profile contemporary designers including Shigeru Ban and Naoto Fukasawa. Earlier this year American furniture brand Herman Miller acquired New York-based textile manufacturer Maharam, whise archive includes work by designers Charles and Ray Eames, George Nelson and Gio Ponti. A renowned design company founded in 1935 in Finland by architect Alvar Aalto and his wife Aino, art promoter Maire Gullichsen and art historian Nils-Gustav Hahl, Artek was built upon the radical business plan to "sell furniture and to promote a modern culture of habitation by exhibitions and other educational means." 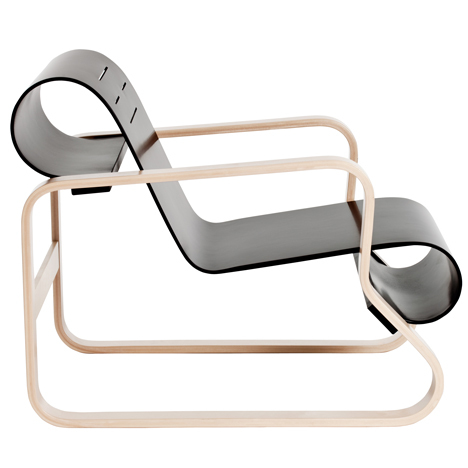 Artek has become one of the most innovative contributors to modern design, building on the heritage of Alvar Aalto. "Vitra has held Aalto and Artek in high regard for decades," explains Rolf Fehlbaum, a member of Vitra’s Board of Directors. "The Finnish design company is more than a collection of furniture; like Vitra it is a commercial-cultural project which plays an avant-garde role in its sector. For Vitra it is important that Artek can continue and further develop this role." Artek will continue as a separate entity. Synergies between different operations will be explored. They primarily relate to manufacturing, distribution and logistics. Mirkku Kullberg, Artek’s CEO, says: "The international dimension, which was a clear goal already in Artek’s founding manifesto of 1935, needed to be revitalized. That arena is where we want to be, and alliances or ownership arrangements are one way of building the future. In our judgment, having an owner from the industry was the best choice for Artek." Kullberg continues: "This is a great opportunity for the Finnish design industry and a major move for Artek, lifting the company to the next stage." The core of the Artek product range consists of Alvar Aalto’s furniture and lighting designs. Under its new portfolio strategy, Artek is extending the range and has acquired the rights to Ilmari Tapiovaara’s furniture collection. In parallel, Artek also continues to work in close collaboration with prominent international architects, designers and artists, such as Eero Aarnio, Shigeru Ban, Naoto Fukasawa, Harri Koskinen, Juha Leiviskä, Enzo Mari and Tobias Rehberger. As an important player in the modernist movement and in the spirit of its radical founders, Artek remains in the vanguard as it searches for new paths within and between the disciplines of design, architecture and art. "There is definitely a comeback of Nordic design and there is a renewed appreciation of Aalto’s work. Tapiovaara of course is much less known internationally, and it is high time that he be discovered," Rolf Fehlbaum adds. The partnership between Vitra and Artek is based on shared values. Proventus CEO Daniel Sachs, former owner of Artek, explains the decision of the transaction: "Vitra has the ideal corporate culture, know-how and industrial resources to take Artek to the next level."